A most attractive tree when flowering, this African tree is a weed in the wet tropics. In moist areas the seeds germinate readily, as well suckers arise from damaged roots. The opposite, pinnate leaves up to about 20 cm long with 8-18 leaflets are leathery, shiny green above but with some hairs on the lower surface. 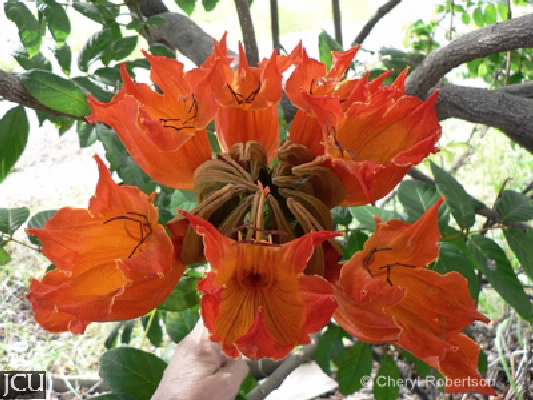 The large 8-12 cm long, flowers are grouped in large clusters, when the calyx splits then the orange to red crinkly petals unfold. The freshly opened flower and the buds are filled with copious nectar, popular with birds. The fruit is an elongate follicle, up to about 20 cm long, that is usually held upright. At maturity it splits along the side to release numerous winged seeds.